*Limit one (1) offer per Collector Account. Offer valid from December 4, 2017 until December 22, 2017 only; order must be tagged in and paid by end of business day December 22, 2017 to be eligible. Minimum total spending before taxes and Energy & Environmental Waste Fee is $60 to qualify for this offer; garments must be submitted together to qualify. Offer valid for Free Pickup and Delivery Valet service orCounter service. Counter customers are not eligible to receive base Miles from The Press Gallery. Please allow up to 4 weeks from the time of purchase for the Bonus Miles to be posted to your Collector Account. ®™ Trademarks of AIR MILES International Trading B. V. Used under license by Loyalty One, Co. and Ortona Management Ltd., o/a The Press Gallery. 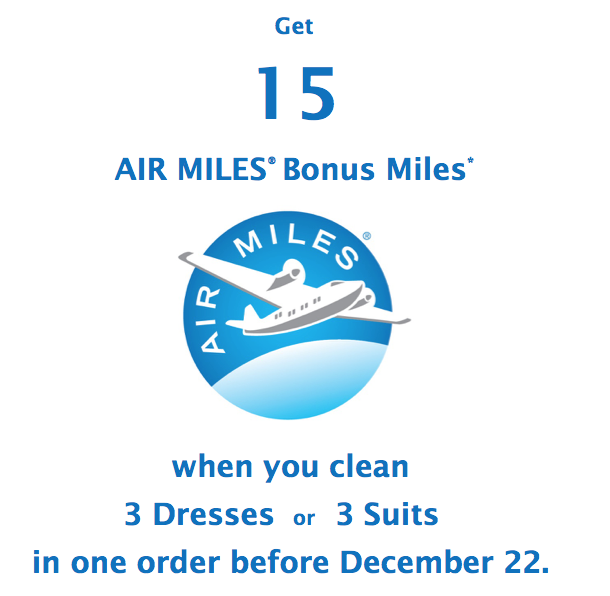 Get 1 AIR MILES Reward Mile for every $20 spent on Valet Pick-up and Delivery dry-cleaning services. Excluding taxes and Energy & Environmental Waste Fee. ®™ Trademarks of AM Royalties Limited Partnership used under license by LoyaltyOne, Co. and Ortona Management Ltd. o/a as The Press Gallery.